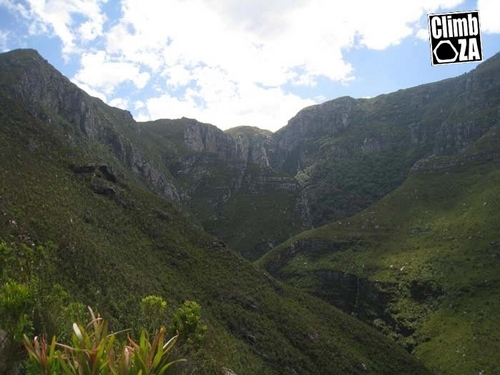 I had a look at (some of) the Grootkloof pics in the gallery http://www.climb.co.za/gallery2/thumbnails.php?album=80. My obvious question is: where is it? It looks like somewhere in the Hex. It also looks like a blast and even more fun than the Wit Els. Way off.... further up north in magalies. Dont know to much about the climbing, all trad AFAIK. Have a look at the old SACIN site for route description. what received the upgrade, the kloof or the whole Magaliesberg? It doesnt look like Pierre's pic fits in with the rest. This Grootkloof just outside Swellendam, it empties into the Buffelsjags Dam. Thanks James. I found it and if I get that feeling again, I'll give it a bash, looks great. More reason to move to Cape Town. I've never been to Swellendam, I thought the rock would look more like Montagu rock. Is there a report from the guys who did the Grootkloof kloofing trip. Would be nice if we can get some feedback on the experienc, difficulty, duration and gear needed to do the trip. Looks absolutely amazing. Yes, those pics are from Grootkloof out-side of Swellendam and the river does empty into the Buffeljags Dam. We did it in december. There was some rain the night before - you shouldn't do it if there has been rain the night before. The kloof is really narrow and channels a lot of water. Access needs to be pre-arraged with the farmer. Next morning 10-12hrs in the river. and bring some extra tat to hang around the chock stones.